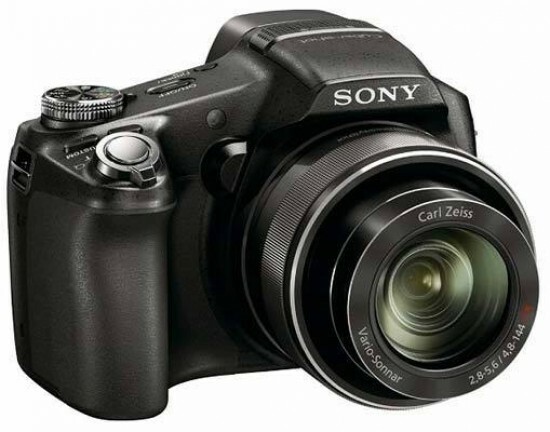 The Sony Cyber-shot DSC-HX100V is a feature-packed super-zoom camera, offering a 30x, 27-810mm zoom lens, 16.2 megapixel back-illuminated Exmor R CMOS sensor, built-in GPS tracking complete with a compass, full 1080p high-definition video recording with stereo sound and HDMI output and 3D Sweep Panoramas and 3D Still Images. Other key features of the well-appointed Sony HX100V include Intelligent Sweep Panoramas, which now include a 42.9 megapixel high resolution mode, a tilting 3 inch LCD screen with 921,000-dots, 10fps burst shooting mode at full resolution, ISO range of 100-3200, Optical SteadyShot with Active Mode which cuts camera-shake while you're shooting handheld HD video, Intelligent Auto Plus, Program and full Manual shooting modes, and support for both Memory Stick PRO Duo and Secure Digital cards. 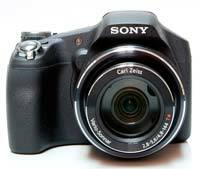 The Sony Cyber-shot DSC-HX100V is available in black for £429.99 / $450. 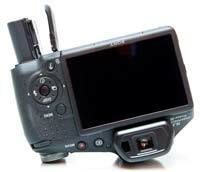 The new Sony DSC-HX100V superzoom is the successor to 2009's HX1 model. Super-zooms now typically offer at least a 24x or bigger lens in a relatively compact body that you can fit inside a small camera bag, with some models upping the ante to a 35x lens. The Sony DSC-HX100V joins the party with a 30x extending optical lens with very respectable maximum apertures of f/2.8 at the 27mm wide-angle setting and f/5.6 at the 810mm full telephoto setting. A camera with a 30x zoom will obviously never be shirt pocketable, but the Sony HX100V is actually relatively compact and lightweight - definitely smaller and lighter than most DSLRs with a typical 3x kit zoom. Interestingly, this does not really affect handling in a negative way. While people with large hands will find that the little finger of their right hand has a more comfortable place underneath the camera than on the right-hand grip, most users will find the grip quite nice. It is ergonomically sculpted and the textured finish provides great purchase for your fingers. Arguably the most remarkable part of the Sony Cyber-shot DSC-HX100V is the lens. As mentioned earlier, this is a 30x zoom that spans focal lengths ranging from 27mm to 810mm. While there are a couple of competitors sporting an even more impressive range, this is still nothing to sneeze at. The zoom is of course stepped, but feels surprisingly smooth in action. It is quite fast too, especially considering the huge focal range that it spans. This is greatly helped by the fly-by-wire manual control ring on the lens barrel, which can be easily assigned to adjust either focus or zoom via a switch on the side. The former is great for macro photography, where the focus can be precisely adjusted while viewing a magnified portion of the image, but we preferred to use it to more accurately zoom through the focal range. The combination of the fast f/2.8 aperture, effective optical image stabilizer and maximum ISO speed of 3200 makes this camera well suited to hand-held low-light photography. Sony has fitted a dual image stabilisation mechanism in the shape of both optical SteadyShot and an ISO range that extends up to ISO 3200. If not quite class leading, it's better than you'll find on your average point-and-shoot. Note that you can't actually turn off the SteadyShot function. Despite its massive zoom lens, the HX100V is still quite a compact superzoom, weighing 577g with the battery and memory card fitted, with a large 3-inch, 921k-dot resolution LCD screen at the rear tilts 90 degrees both up- and downward. This makes it quite flexible, but it's still not as great as the vari-angle design of some competitors. Outdoors visibility is very good, definitely a lot better than many other screens. Above the lens is a bulge that resembles a prism hump, although of course there is no pentaprism to be found on the HX100V. 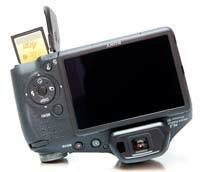 You can frame your shots using either the aforementioned rear screen or the electronic viewfinder (EVF). Switching between the two is done either by way of a button to the right of the mock prism housing, viewed from the back, or via the eye proximity sensor around the viewfinder eyepiece, which cleverly switches automatically when you lift the camera to your eye. The EVF itself is crisp and reasonably fluid, but very small. One gets the feeling that this was one of the areas where Sony cut corners in order to keep the price within reasonable limits. Press the small lozenge-shaped On/Off button on the shiny silver top plate and the Sony Cyber-shot DSC-HX100V quickly readies itself for action in a just over a second. The adequately sized shutter-release button has a definite halfway point, determining focus and exposure with a bleep of affirmation, focus points highlighted as green rectangles on the LCD. 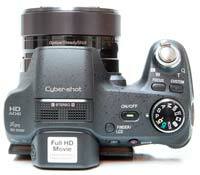 Go on to take the shot and the JPEG images are committed to memory in a single second, the screen momentarily blanking out and then displaying the captured image before the user can go on to take a second shot. The shutter release button is encircled by a responsive forefinger-operated push/pull rocker zoom lever, with the camera taking around five seconds to zoom from wide-angle to full telephoto. The HX100V's built-in stereo microphone is also located on top of the camera, plus the Custom button which as the name suggests can be customised to access one commonly used setting, such as ISO speed or Exposure Compensation. The Focus button switches between the Multi AF, Center AF and Flexible Spot AF modes. A round shooting mode dial with a knurled edge and positive action completes the HX100V's top-plate, letting you quickly switch between the various shooting modes that are on offer. Sony has included Intelligent Auto scene recognition, which works in virtually identical fashion to the intelligent auto modes of Panasonic's and Canon's compact ranges. Simply point the HX100V at a scene or subject and the camera analyses it and automatically chooses one of 11 pre-optimised settings to best suit. There's also the new Superior Auto mode, which places greater emphasis on reducing blur and noise and increasing the dynamic range. Adding to the HX100V's snapshot simplicity, these features join face recognition and smile shutter functionality on board, the former mode biasing human faces in the frame and the latter mode firing the shutter when it detects a smiling subject. The Face Detection system automatically adjusts the focus, exposure and white balance for people in the frame, and can even be set to distinguish between children and adults. Smile Detection offers three self-explanatory options, Big, Normal and Slight. Used in conjunction, the Face and Smile Detection systems do result in more hits than misses, especially in contrasty lighting conditions, although all those smiling faces could ultimately freak you out a little! The self-portrait options in the self-timer menu work by automatically taking the shot with a two second delay after either one or two people have entered the frame. In addition to the regular Program mode, which provides the full range of camera options and additionally allows you to change settings like the ISO speed and metering, is the welcome inclusion of a fully Manual mode that lets you independently set the aperture and shutter speed, which will instantly appeal to the more experienced photographer. The ability to choose from 30 - 1/4000th second shutter speeds and nine different apertures opens up a lot of creative potential, and there are also Aperture and Shutter Priority modes which helpfully narrow the skill gap between the Program and Manual modes. Sadly there's no support for the RAW file format, which would really have been the icing on the cake for serious photographers looking for a real alternative to a DSLR. For those who like a healthy dose of gimmickry with their gadgets, Sony claims that the HX100V is one of the first of its type (along with three co-announced Cyber-shot siblings) to offer a 3D still image mode - an addition to the now expected 3D Sweep Panorama mode and the 'cheat' of the lenticular print-like Sweep Multi Angle mode, also again featured here. This option doesn't require two lenses and two sensors to produce a stereoscopic image. 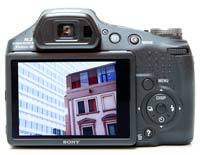 Instead the Sony takes two consecutive shots from two different vantage positions and combines them for its 3D effect. Like all of its stereoscopic rivals you'll still need a 3D equipped TV to properly view the results. In the Hand-held Twilight and Anti Motion Blur shooting modes, the DSC-HX100V takes six shots in a rapid sequence, typically at a high sensitivity setting and a (relatively) fast shutter speed, and then combines them into a single image that has somewhat less noise than a single shot taken at the same ISO and exposure settings. In my experience, the difference between the two modes is that in Anti Motion Blur mode, the camera is more willing to pick a really high ISO setting like ISO 1600 to maintain a fast shutter speed, whereas in Hand-held Twilight mode, it will only go as high as absolutely necessary to avoid camera shake at the chosen focal length. If light levels are truly low, however, the HX100V will pick a high ISO speed even in this mode. Backlight Correction HDR is a feature where the HX100V automatically shoots two frames quick succession, varying the exposure for each one then combining them to create a single image with the most detail possible in both the shadows and highlights. You can see from the example on the Image Quality page that this feature produces a photo with noticeably more dynamic range than one taken using one of the standard shooting modes, but at the same time without replicating the often "false" look of many HDR programs. Note that you should mount the camera on a tripod to avoid any unwanted camera-shake, and we were disappointed that you can only turn Backlight Correction HDR on or off, with no options for varying the intensity of the effect. Background Defocus attempts to mimic the sharp subject and out-of-focus background effect that DSLR owners typically enjoy, again shooting two frames in quick succession but this time varying the aperture. Present and correct is the increasingly ubiquitous ability to shoot High Definition video clips, but unlike its main competitors the HX100V does so at full 1080p HD rather than 1080i or 720p, and also with stereo sound rather than mono. The various options are 1920x1280 or 1440x1280 pixels at 50p or 50i in the AVCHD format, and 1440x1280, 1280x720 or 640x480 pixels at 25fps in the MPEG4 format. There is full use of the optical zoom during recording so you can really make the most of that 30x focal range, plus the ability to change the EV level, white balance, and metering options and turn on either standard SteadyShot or the new Active Mode mode, which provides up to 10x more effectiveness with no side-effects. There's also a direct HDMI output from the camera, useful for playing back your footage on a HDTV set, although sadly there's no HDMI cable supplied in the box. The dedicated Movie button on the rear of the DSC-HX100V allows you to start recording a movie with a single push of a button, and then stop recording by pressing the same button - a lot more intuitive than having to select the movie mode then press the shutter button, as on most compacts. You can also activate the movie mode via the Shooting Mode dial. GPS is a feature that has slowly but surely been finding its way into digital cameras as the technology has got smaller and cheaper to implement, making its debut on last year's HX5 and unsurprisingly being inherited by the HX100V. This potentially allows you to seamlessly geo-tag your photos (latitude and longitude co-ordinates are stored in the EXIF data) and then sort and display them using geo-friendly websites such as Google Earth and Google Maps or the supplied Picture Motion Browser PC software. The HX100V also uses the GPS to keep the camera time accurate, and even has a built-in compass that shows shows which direction you were pointing when the picture was taken! The GPS function can be manually turned on or off and the current GPS status is displayed as a small icon on the LCD screen. Three bars appear next to the icon when the GPS has synced with one or more satellites, which unfortunately takes a few minutes from powering on the camera. Thankfully once it's synced, the HX100V's GPS receiver works a lot better than most other GPS-capable cameras that we've reviewed, saving accurate positioning information for the majority of the images that we shot in built-up central London, making this camera much more useful for urban photographers. The main downside of the HX100V's GPS is the subsequent drain on battery life, with the camera only managing just over 200 shots with GPS turned on instead of the 300 that it can manage without. The Sony HX100V supports TransferJet, a relatively new wireless transfer protocol that's supported by most of the major manufacturers. TransferJet allows you to very quickly (up to 375 Mbps) and easily copy images between two compatible devices - Sony recently showed us a neat docking station that instantly transferred files from camera to picture frame just by resting the camera on the station, with no need to pair the two devices. There are a few limitations - TransferJet is reliant on using a compatible Sony Memory Stick, which as you'd probably expect are more expensive than the standard ones, and the receiving device must also be compatible with this relatively new protocol. Somewhat surprisingly for a camera in this class, the Sony Cyber-shot DSC-HX100V does not feature a hot-shoe, so the only way to sync up an external flash with it is to optically slave it to the built-in unit. Speaking of which, it lacks a mechanical button to simply pop it up. Instead you need to go into the Flash menu by way of the Right arrow key, choose the required flash mode and exit the Flash menu. The flash will only pop up when you (half-)press the shutter release. If you don't want to use it any more, it is not enough to push it back - you need to re-enter the Flash menu and select the Flash Off option. Otherwise it will pop up again the next time you hit the shutter button. The rear of the DSC-HX100V is dominated by the large 3 inch LCD screen, with the resolution now a much improved 912k dots, fixing one of our main criticisms of the HX1. To the right of the screen is the useful one-touch movie record button and a small button for playing back your images. Users have the ability to dip in and out of created folders of images or the calendar view, view thumbnails, select slideshows and choose transitional effects and accompanying music, or delete shots. Press the shutter button halfway and you're helpfully catapulted back into capture mode. And that's basically it. With a press of the Menu button in playback, users have access to a few in-camera retouching effects, including the ability to crop and sharpen an image and apply red-eye correction. Underneath the Playback button is a traditional round navigation pad which you can use to navigate through menus and options, in conjunction with the small button in the middle which activates whatever it is you've chosen. The four directions on the navigation pad also provide a quick way of setting the Display, Flash, Timer and Continuous Shooting options. Finally, there are buttons for the camera's menu system and for deleting images. The menu button accesses most of the camera's main functions - image size, burst settings, bracketing, exposure compensation, ISO, white balance, focus mode, metering, smile detection, and face detection - plus an icon at the bottom to open the four Settings menus. The latter includes the ability to deactivate the camera's 'bleep' that otherwise sounds at every button press, choose the movie format and activate red-eye reduction if required. Pressing the drive mode button brings up two options, single or burst, with high-, mid- and low-speed continuous options then available in the Menu system. Out of these, the high-speed continuous mode is the most remarkable. The HX100V takes up to 10 full-resolution photos at a frankly astounding 10 frames per second, which is faster than most compact cameras and indeed most DSLRs too. The only fly in the ointment is that once the burst is completed, it takes over fifteen seconds for the camera to clear the buffer, during which you cannot take another picture. In the other two continuous shooting modes, the Sony HX100V also takes up to 10 pictures, but at slower speeds of 5 or 2 frames per second. The bottom of the Sony HX100V features a standard metal screw thread for attaching it to a tripod which is conveniently located in the centre. A plastic cover protects the lithium-ion battery and the removable memory card, with the HX100V supporting the SD / SDHC format in addition to Sony's own proprietary Pro Duo Memory Stick format. Both sides of the HX100V have a small metal eyelet for the supplied wrist strap, while on the left is the HDMI port underneath a sturdy plastic cover and a DC In port for charging up the HX100V's battery, which rather annoyingly can only be achieved with the battery inside the camera.